Hon. 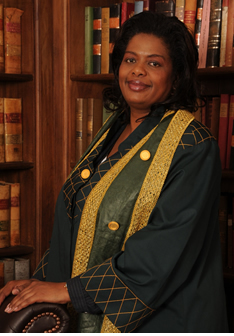 Justice Njoki Susanna Ndung’u is a Judge of the Supreme Court of Kenya. She is an Advocate of the High Court of Kenya and holds both a Masters in Law degree (LL.M) in Human Rights and civil liberties and a diploma in Women’s Rights. She has previously work experience as State Counsel in the Office of the Attorney General, Programme Officer at the Institute for Education in Democracy, and National Protection Officer at United Nations High Commissioner for Refugees. She has also worked as a Political Analyst in Conflict Management at the African Union. Justice Njoki S. Ndung’u is a former Member of the Pan-African Parliament and of the 9th Parliament in the National Assembly of Kenya, where she sat in the Standing Committees on Defense and Foreign Affairs, Administration of Justice and Legal Affairs and the Parliamentary Select Committee on the Constitution. She is the architect of the Sexual Offences Act 2006, and of amendments to the Employment Act 2007 providing for paid maternity and paternity leave, as well to the Political Parties Act 2007 on affirmative action measures for women in political participation.